Multicolor — Blue, yellow, pink, green, and black wiggle eyes in packs of 50 or 100. The Oval/Round Pack includes 100 wiggle eyes in two different shapes. Stack Pack, Pkg of 560 — Organize and store your wiggle eyes in the Stack Pack. The five-tier plastic container comes with 560 round and oval black wiggle eyes in popular sizes, including 5 mm, 7 mm, 10 mm, 15 mm, and 20 mm. Round, Pkg 100 — Package includes 25 black eyes in each size, including 7mm, 10mm, 12mm, and 15mm for a total of 100 pieces. Large Assorted, Pkg 100 — Package includes 40 each of 28 mm and 30 mm wiggle eyes, and 10 each of 35 mm and 40 mm for a total of 100 pieces. Available in Assorted or Black. Large Black, Pkg 100 — Package includes 40 each of 28 mm and 30 mm wiggle eyes, and 10 each of 35 mm and 40 mm for a total of 100 pieces. Available in Assorted or Black. Painted — These colorful wiggle eyes have painted eyelid and eyelash details. 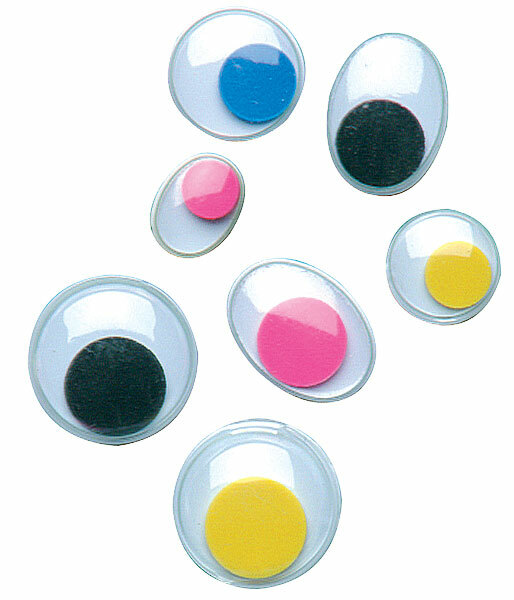 The package of 100 includes 7 mm, 10 mm, 12 mm, and 15 mm round wiggles eyes in assorted colors. 500-Piece Pack — This fun multi-pack includes 125 pieces each of Black, Multicolor, Painted, and Bright Color wiggle eyes. Sizes range from 10 mm to 20 mm.